Tylenol Extra Strength 50 Count - 2 packs (from Medi-First). Quick Relief from headaches, backaches, muscular aches, and more. These individually packaged Tylenol Extra Strength, are perfect to keep at the office. Each package has 2 - 500 mg caplets of Acetaminophen. Tylenol Extra Strength 50 Count - 2 packs (from Medi-First). 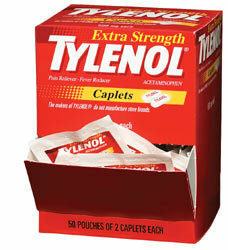 These individually packaged Tylenol Extra Strength, are perfect to keep at the office. Each package has 2 - 500mg caplets of Acetaminophen.